Life and death hang in the balance when Teach and Anne are given a dangerous mission. It’s a mission that will test their love, loyalty and devotion, forcing them down a path neither one could have ever imagined (goodreads). 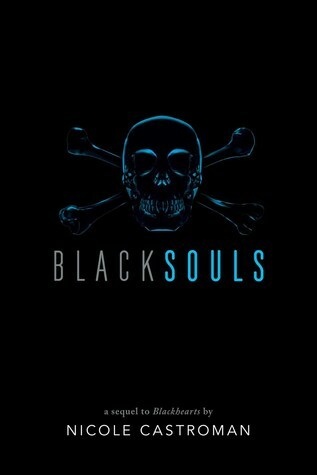 Blacksouls has 100% more pirates! Plot: Earlier this year, I read and loved Blackhearts. I loved how Castroman took her time to explore the characters and really set the scene. Admittedly, Blackhearts was a rather slow-paced book, but the character dynamics kept me glued to the pages. Blacksouls did a complete 180 in terms of pacing. Starting immediately after the events of Blackhearts, Blacksouls was full of exciting battles and surprising betrayals. I honestly felt like I was in a Pirates of the Carribean movie while reading this book! For all of its action, I did miss the quiet of Blackhearts, but I know that readers who prefer more action in their novels will enjoy Blacksouls. Characters: Both Teach and Anne went through a considerable amount of change in Blacksouls. I liked reading Teach's chapters because I could see the subtle difference in his character and how each action led him in the direction of becoming Blackbeard. Anne's changes weren't as surprising because she was already portrayed headstrong and stubborn, but I did see how their development affected their relationship. Blacksouls also introduced new characters who instantly became my favorite. From pirates to trusted first mates, Castroman created a fun and memorable cast of characters! Blacksouls also highlighted the series' first villains. The villains fell flat with me mostly because I didn't think they received enough back story to make their actions believable. I'm hoping that the third book (!?!) will delve more into their motivations. Worldbuilding: The atmosphere of Blacksouls was completely different from that of Blackhearts. Blackhearts took place in dreary England and always had a sense of melancholy. Blacksouls balanced itself between the sea and Nassau. I loved that Nassau was a complete change of scenery from England and it allowed Anne to do a lot of introspection. She was in a world where people looked like her, but the slave trade was still going strong. She had to deal with the guilt of being free and wanting to do more than she physically could. 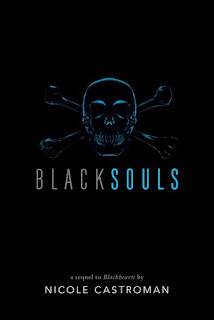 Short N Sweet: Nicole Castroman continues to pull at my heartstrings with Blacksouls. This will be a favorite for anyone who wants a life at sea!